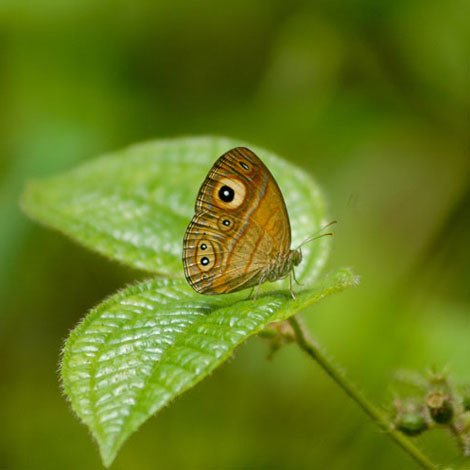 Sri Lanka is home to 248 species of butterflies with 31 of these being endemic to the Island. The majority of species are found in the foothills (up to 3,000 feet elevation). A much smaller number of species are found above 4,000 feet while 20 species of butterfly are restricted to the low lying dry zone (below 500 feet elevation. The number of butterflies peaks in two seasons during the year. The first of these is during the Southwestern monsoon in the months of March to April. The second is during the Northeastern monsoon which continues from September to October. The Ceylon Birdwing is the largest endemics of the country and is found in large numbers in the Sinharaja Forest Reserve. Butterflies (Order: Lepidoptera) are brightly colored flying insects with two pairs of large wings that vary in color and pattern from species to species. Butterfly wings are covered with overlapping rows of tiny scales, a characteristic butterflies share with their fellow Lepidoptera, the moths. Butterflies come in a variety of sizes. The world’s smallest known species, the blue pygmy found in southern California, has a wingspan of just over half an inch. The largest species, New Guinea’s Queen Alexandra's birdwing, can measure up to twelve inches from wingtip to wingtip. The average lifespan for an adult butterfly is 20 to 40 days. Some species live no longer than three or four days; others may live up to six months. Like other insects, butterflies have a hard exoskeleton, three pairs of jointed legs, antennae, compound eyes and three main body parts: head, thorax and abdomen. On the head are the eyes, antennae and proboscis – the long, flexible "tongue" used to sip nectar and other liquids. The thorax is the point of attachment for the two pairs of wings, forewings and hind wings. The abdomen contains the reproductive and other vital organs. A caterpillar’s first meal is its own eggshell. It then spends most of its time eating the leaves of the plant on which it hatched. An adult butterfly uncoils its long, straw-like proboscis to sip nectar from flowers, juice from rotting fruit and water from puddles. Exact numbers are not known since there are about 17,500 species of butterflies spread throughout almost the entire world. Antarctica is the only continent on which no butterflies have been found. Butterflies are found worldwide except on the continent of Antarctica. Many species migrate to avoid adverse conditions. Most migrate relatively short distances, but monarchs and several other species migrate thousands of miles. From egg to adult, butterflies undergo a series of physical transformations known as metamorphosis. After mating, the female butterfly lays her eggs on a caterpillar food or “host” plant. The eggs can hatch within a few days, or within months or even years, depending on whether or not conditions are right. A caterpillar begins to eat the host plant. The caterpillar sheds its skin several times during this stage. It then seeks a sheltered spot, suspends itself by silken threads and sheds one last time to reveal skin that will harden to form the chrysalis or pupa. Days, months or even years later, depending on the species, a fully developed winged adult emerges from the chrysalis and the cycle begins anew. Many butterflies have developed interesting ways of defending themselves from predators. One method is disguise, or “cryptic coloration”, where the butterfly has the ability to look like a leaf or blend into the bark of a tree to hide from predators. Another method is chemical defense, where the butterfly has evolved to have toxic chemicals in its body. These species of butterfly are often brightly colored, and predators have learned over time to associate their bright color with the bad taste of the chemicals. The greatest threats to butterflies are habitat change and loss due to residential, commercial and agricultural development. Climate change is also threatening species of butterfly. The Edith’s checkerspot butterfly, which ranges from Baja to Canada along the West Coast, has been moving northward and upslope. But for two subspecies – the Bay and Quino— their progress is blocked by the vast urban landscapes of San Francisco and San Diego, respectively. Both subspecies are now critically imperiled.